Bake up some Halloween fun with these simple sugar cookies. 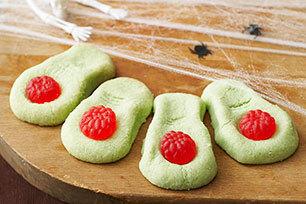 Made with just 4 ingredients, these ghoulishly-green cookies are perfect for kids of all ages. Beat butter in large bowl with mixer until creamy. Add flour and dry jelly powder; mix well. Roll dough into 18 toe-shaped pieces; place, 2 inches apart, on baking sheet. Flatten 1 end of each. Use sharp knife to make crosswise slits in each toe for the knuckles. Flatten Maynards Swedish Berries slightly with rolling pin. Place 1 on flattened on end of each toe for the toenail. Bake 10 to 14 min. or until edges are lightly browned. Cool on baking sheet 5 min. Remove to wire racks; cool completely.